A while back a chiropractor I was seeing suggested I go barefoot as often as possible to help the pain in my feet caused by rheumatoid arthritis. (Even with my improved health I have only one pair of shoes I can wear regularly that don’t kill the balls of my feet.) His belief was that as the pain in our feet worsens with RA, we tend to rely more on shoes with a lot of support and the muscles in our feet become weak. • The introduction of the elevated heel and the pointed toe marked the beginning of modern foot disabilities. Children left to go barefoot more often had less toe deformity, greater ability to spread toes (this sounds glorious) and denser muscles on the bottoms of their feet. • Keeps feet from getting lazy. • It is more relaxing. • Greater amount of Chi can be absorbed. While I have been researching barefooting benefits, I have also been moving away from wearing slippers in the house this fall/winter and working out barefoot as a way to slowly prepare my feet for this spring and summer when I plan to dive into minimalist shoe wearing/barefooting on walks with Izzy and when we hike. As always when I research something, everyone in my family has to hear all the details of my excitement. What a nice surprise for me on Christmas morning to unwrap a pair of brown Vibram Five Fingers without even asking for them. Someone is obviously listening to me. • These shoes are super lightweight. • I have worked out in them twice. My feet experienced some swelling, but these shoes allowed for the changes and there was no pain at the end of my workout. • I wore these shoes all day at home where I am getting a good feel for them. At the end of the day, no shooting pain when I took them off. This is huge! • The KSOTrek pair can be worn with toe socks for extra warmth. • Although these shoes look a little wacky and I plan to only wear them for walks/hikes, I can see how they will be so comfortable that I won’t want to wear other shoes. • They are initially a challenge to get on the feet. I especially had a difficult time working my baby toe into the toe slot and wonder how other folks with more deformities in their feet would do with these shoes. • During a flare in my hands or shoulders, there is no way I would have the energy to put these shoes on. 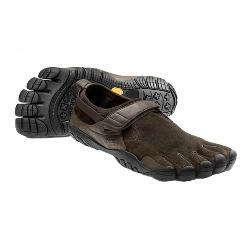 • The Trek version of Vibram Five Fingers that I have can be worn with socks (Steve bought me Injinji socks) as I mentioned in the “pros”. However, with poor circulation that causes my feet to become extremely cold even with a regular pair of socks under wool socks and insulated boots, there is no way I will be able to wear these outside until it warms up. As I continue wearing the Vibram Five Fingers and transitioning into more barefoot walking, I will do some updates to let you know how it is going. In the meantime, here is a great video to watch on barefooting put out by Harvard Professor Daniel Lierberman, who is known for his research on barefoot running. Complete Happiness: My Rheumatoid Arthritis Has Come a Long Way! Rheumatoid Arthritis Anniversary. It’s Here Again! Annie, from what I have read you have to slowly work into becoming a bare footer so you don't destroy your feet. One article suggesting walking outside to get your mail barefoot until your feet callous over a little and then add a short walk. I will probably take my Vibrams with me when I first start out on barefeet. ha, those look very interesting! that is also one of my problems, the toes swelling after walking and then my shoes feel really tight and it's a right pain. something to consider for sure! good luck with the experiment, there is something lovely about walking barefoot on grass or sand… unfortunately it'll be months before it's warm enough to do either! Wow Cathy, I have never heard of these. Very interesting. Even when the rest of my body is not hurting, my feet still are. I am looking forward to what you have to say about these after you have used them for a while. Thanks so much for sharing that information. Those are some wild looking shoes. I have gone barefoot all of my life. Most days I still go barefoot however occasionally, due to my damage in my feet from RA, I have to wear some cushy house shoes. At work I have to wear steel toe (heavy) work boots. Squirrel, sometimes my feet also swell inside my shoes or boots. I don't have RA but I love being barefoot. I have always felt that when I have shoes on I am suffocating. I can't wait to try these out, what a great sister to try them out first. Make sure you have a good foot lotion because your feet will dry out faster without shoes and need that extra tlc. It will take time but before you know it you will love not having shoes on your feet. Let those feet be free to wiggle and feel life. Have you seen the book Earthing? It's about the benefits of grounding – having bare skin in touch with the earth. They've created bed sheets and computer mats to replicate these effects. Some amazing testimonials for RA in the book. I wanted to say thank you for this review. I've had RA since i was little though it did not bother me shoe wise till I took a bad turn after my daughter was born. It took me awhile to get better; however, it still hurts to wear anything other than flip flops and the occasional sandal for long. I've been looking into the VFF's recently since seeing them and am glad to hear from someone who had similar questions and problems before getting them. Thanks again! Thanks for the comment. I have been wearing the Five Fingers regularly and the more I wear them the more comfortable they feel. Good luck! Thanks! I actually ended up buying some today, your chronicle of your shoes tipped me over the edge on waiting or getting them now. lol. I loved them from the moment I put them on! I never thought a shoe would feel so natural and have a noticeable improvement immediately. XD I totally wore them out of the store and got my kiddo some too (she ran around in them for an hour straight lol), money may be tight but this was more than worth it. I ended up buying the bikina's but I already know I'll have to get the kso treks eventually so I can keep up with my baby when we go hiking! 🙂 Thanks again hun! Faen,yay to you and your litle one! I am so happy about your new purchase. Thanks for sharing that with me. It made me smile thinking about your kiddo running around for an hour in new comfy shoes. If there was one thing I could do over with my kids it would be less shoe wearing and buying barefoot shoes for them. Good luck! I would love to hear how they do longterm. I stumbled upon this post when I googled “rheumatoid foot”. I was diagnosed with osteo arthritis in my late teens (I'm 37 now), and RA 4 years ago. I have ALWAYS preferred to be barefoot, even for my hiking and rock climbing in my younger days. I was mortified when I was diagnosed with RA, because my Rheumatologist discovered that it is concentrated in my feet. She speculates that I've had it since my late teens, and because it wasn't treated for so long, I have a lot of damage in my feet. I can't wear closed toed shoes to save my life, they're just too painful. I'm always in hiking sandals when I do wear shoes, so my toes can spread and my feet can swell without being constricted. I recently started looking in to the Vibrams, and wondered how they were for folks with RA. I talked to my Orthopede and my Rheumatologist about they and they were both supportive of me trying them. Reading your post is the last of my research!! I'm going to take the dive! I'm lucky that I do't have too much deformation in my feet, and my hands are relatively unscathed, so putting them on shouldn't be too bad. I'm looking forward to trying them! Thank you for sharing your experience! I am excited for you and hope that you will let me know how your Vibram experience goes. There is another gal with Ra that wears Vibrams exclusively with good results. I have to say this. I wore a pair of these shoes and they prematurely gave me a serious case of premature arthritis. I did everything the seller said. I had a long period of short walks that were suppose to break my feet in. One day after a long walk I was in immense pain. Its now been three months since August 2012 and my foot feels like it will never be the same. Be cautious with these shoes. They are already being sued for making false health claims. contact me at richcapo@gmail.com for further info. I too have problems with my feet including bunions that may be RA and a toe that crosses over. I can now have all 5 toes on the ground. My heel has toughened up and does not crack anymore. I love being barefoot and these are the best!